The Honourable Supreme Court today restrained ISKCON Mumbai society from interfering with the day to day management of the ISKCON-Bangalore. It also instructed both the parties to maintain status quo. 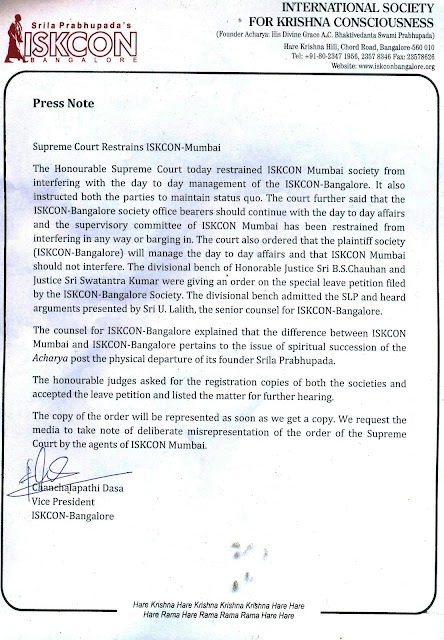 The court further said that the ISKCON-Bangalore society office bearers should continue with the day to day affairs and the supervisory committee of ISKCON Mumbai has been restrained from interfering in any way or barging in. The court also ordered that the plaintiff society (ISKCON-Bangalore) will manage the day to day affairs and that ISKCON Mumbai should not interfere. The divisional bench of Honorable Justice Sri B.S.Chauhan and Justice Sri Swatantra Kumar were giving an order on the special leave petition filed by the ISKCON-Bangalore Society. The divisional bench admitted the SLP and heard arguments presented by Sri U. Lalith, the senior counsel for ISKCON-Bangalore. The counsel for ISKCON-Bangalore explained that the difference between ISKCON Mumbai and ISKCON-Bangalore pertains to the issue of spiritual succession of the Acharya post the physical departure of its founder Srila Prabhupada. The honourable judges asked for the registration copies of both the societies and accepted the leave petition and listed the matter for further hearing. The copy of the order will be represented as soon as we get a copy. We request the media to take note of deliberate misrepresentation of the order of the Supreme Court by the agents of ISKCON Mumbai. 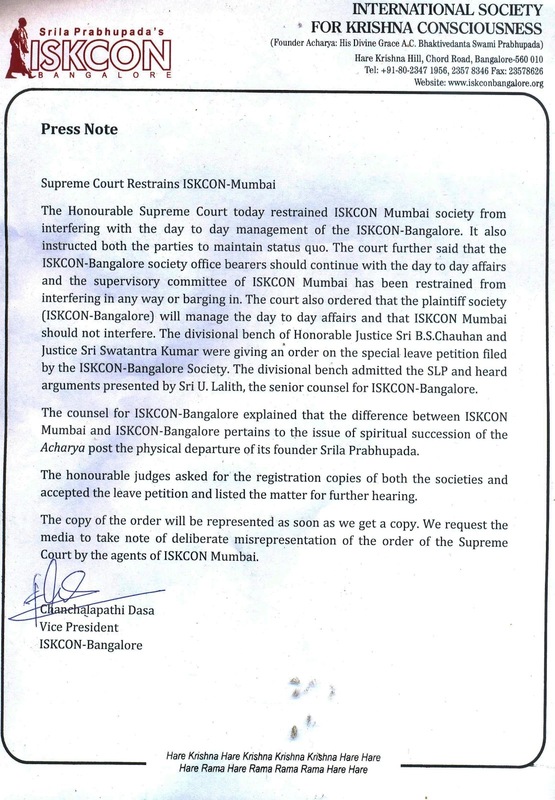 Supreme Court ordered ISKCON Mumbai society to keep away from ISKCON Bangalore. This actually means that the Supreme Court as ordered a stay on High court decision. 2. Supreme Court has taken up the case ordering an inquiry on registration copies of both party.